Welcome to Sorority Report, a feature in which we celebrate the best and battiest of Rush Week emails from sororities. Part 1 extolled the virtues of Spanx. Part 2 sang the praises of Vaseline and warned sternly against "natural looks." Part 3 lectured against allowing "randos" to wear Greek shirts in the general proximity of liquor stores. The amazing thing about many of the Rush Week emails we have received is their specificity: the color of one's nails, hair, and eyeliner is outlined, as is the permissible length of a skirt, the thickness of an eyebrow. Today we have not one, not two, but three Powerpoint presentations for you, all of them detailing the exacting requirements for Rush Week dress while meeting Potential New Members (PNMs). All three are from either last year or this year (Correction: The email from USC's Sigma Delta Tau, Mu Chapter is from 2013. I regret the error.) . Let's get to it, and may God have mercy on each of our individual souls. 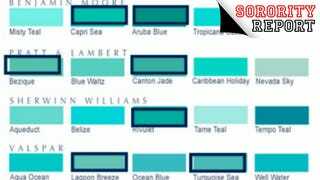 The first, from the University of Southern California's Sigma Delta Tau, features the nine permissible shades of turquoise a SDT woman may wear during Rush. As we've seen in previous emails, French or light pink manicures are also required. The second, from a USC sorority our tipster didn't specify, is another helpful photo slideshow that outlines the hairstyles, types of white shorts, and exact sandals that may be worn during Rush. Ponytails and buns are strictly forbidden, in what we're starting to realize is a Rush standard. It also makes sure to specify that leg-shaving is mandatory: "Be showered and shaved (don't want accidental leg grazing to be more awkward than it already is." "I want us all to look uniform," the recruitment leader adds. You don't say?